Rangers v Ufa: Can the Gers have the last Laff? Here we are in the Europa League Play-off round with the majority of our support convinced that the tie against FC Ufa is pretty much a formality.....Who'd have thought it ? Not me, I saw the EL group stages 2018/19 as unrealistic, but an excellent, solid start from the new management team together with good recruitment and a slice of luck in the draw see us 180 minutes from making the groups and all that follows from that. FC Ufa stand in our way and the general vibe of optimism amongst us is well founded given our performances to date but given we don't know much about them, has to be toned down a tad if we don't want to get complacent (can't imagine SG allowing the players to get so). According to the Gersnet prediction league, a 2-0 win with the first goal coming from Morelos is a cert and bookies may go out of business on Friday! I'm not going to go into heavy research mode to compile a dossier on the Russians but here is some info posted earlier in the week by someone who does know a little about the club and their league. 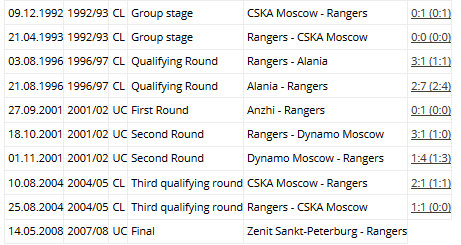 Rangers and Ufa analysed by Russian Blog (in English). What I will point out is that if you go by the co-efficient table, Russia sit in 6th place. That is to say that outwith the five Big Leagues, they come next, comfortably ahead of the likes of Portugal. This tends to suggest the level of the top half of the Russian top division is very decent and we have to take into account and respect that Ufa finished 6th last season. They ain't no minnows. It's curious, but the team that we beat to win the Cup Winners Cup in 1972 skelped FC Ufa 3-0 on Monday (Ufa were resting several players) and the team that beat us in the UEFA Cup Final in 2008 are the team Ufa will play sandwiched between their matches with us. Another interesting aspect about what is a 4th qualifier: only five times in our history have we successfully negotiated four stages of European competition on the spin and three of those were when we made the Final. I appreciate that that is a somewhat unfair comparison given how qualifiers heavily feature now but all the same, it would be only the 6th time IF we get past FC Ufa. There can't be many teams playing in European competition that can say they have never lost, perhaps FC Ufa are the only one who can? The context being that this is their first season in European competition and to date they have 1 win, 3 draws and 2 successfully negotiated ties, both being settled with late goals, away from home. 'Sources' say that their strength is in defence, keeping things tight and counter-attacking. We'll only know to what level after the game on Thursday. The atmosphere at Ibrox should be fantastic and should give us impetus to put them under pressure early doors. It goes without saying that an early goal for us would be welcome and help set-up the night. Despite the Killie win, I'd imagine that McGregor and Flanagan will come back into the side and hope that Goldson and Katic are fit. Jack will probably be back in with Arfield and Ejaria. 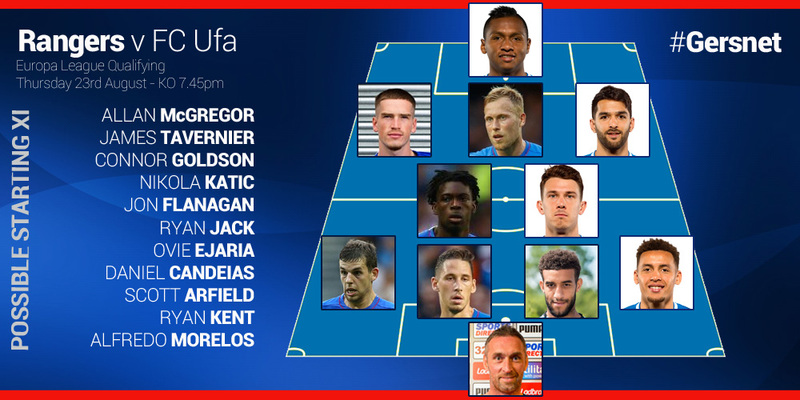 Candeias and Kent will supply some width and Morelos in and around the penalty box. Kyle Lafferty may have to be content with a place on the bench. Candeias and Ejaria are one booking away from a suspension. All things considered this is a huge game and it'll take another excellent performance to get the result we want. I think we'll get the win but we could do with the uniform Gersnet prediction above coming in, at least two goals of advantage and for them not to get an away goal.